So what are we looking at? The blue line shows almost a century of the average income of the bottom 90% of American earners (in constant, real 2008 dollars – scale on right side). This represents the typical American worker and the fate of the working/middle classes. Basically it shows nine different trends or periods. From 1917 until 1929, there was no improvement at all (actually a dip in the 1920-21 depression). Despite all the talk about “roaring twenties”, it wasn’t for the average American worker. 1929-1933, incomes really drop precipitously as the nation falls into the Great Depression. 1933-1937, incomes begin to recover based on the government spending programs of the New Deal and correction of the banking/financial crises of 1932-33. But the progress stumbles in 1938 as Roosevelt and Congress switch course and try to balance the budget before we’re back to full employment (are you listening Obama?). 1938-1943 incomes really grow dramatically as the nation regains full employment and unions gain power. The driver of the recovery is the near unlimited willingness to spend to arm for World War II and the demand for food and other items by warring allies. 1944-1949, incomes stagnate again, partly as a result of demobilization of the war effort. 1949-1973 brings the Golden Age. Real economic growth in the U.S. is the strongest it’s ever been and thanks to Keynesian government policies, a productivity-sharing social contract between managements and unions, and strong world demand, the workers get their share of it. This is the period of fastest U.S. growth. 1973-1993 brings twenty years of declining real incomes for most workers. Part of it is driven by slower growth brought on by two oil price supply shocks. Part is inflation (although only until the mid-80’s). Part is driven by a major political shift towards conservative free market policies (“Reaganomics”). And part is driven by a weakening of unions and union membership. The economy, while it grows, doesn’t grow near as fast as it did in the Golden Age. 1994-2000 shows a slight recovery in incomes during the Clinton administration. 2001 starts another decline and it’s been pretty much downhill ever since. Note that the graph ends in 2008 (last available data), but other more recent data indicates the time series has continued to decline significantly. 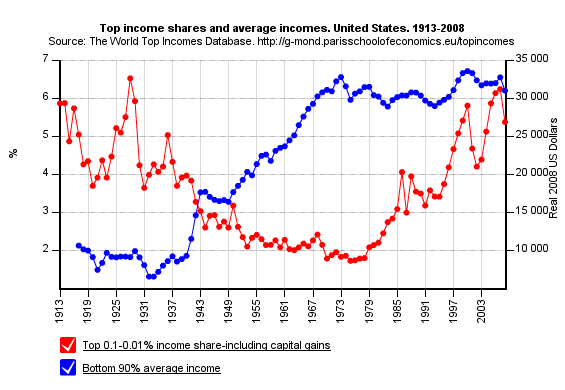 So what can we conclude from the typical worker incomes, the blue line of average incomes for the bottom 90%,? Well, yes, as some conservatives and libertarians have been pointing out, today’s incomes are historically high – around $32,000 per worker. And consumption by household is even higher. But consumption has risen despite incomes stagnating recently. It’s because many, many more households now depend on two workers for incomes. Yes today’s incomes are dramatically higher compared to 76 years ago – roughly 6 times higher. But all of the increase happened in the first 38 years after 1932. Today’s incomes per worker are actually lower than they were in 1973 – 38 years ago. Now let’s consider the red line. This shows the percentage share of the national income earned received by the top 0.1%, the top one tenth of one percent. These are the really, really rich. There are really only three periods here. The period before the Great Depression. Observe that it really was a roaring twenties for the really rich. In the decade of 1920-1929 their share of national income rose from around 3.5% to over 6.5% – all while the average American worker stagnated. The game was rigged. As the U.S. economy grew in total GDP terms in the 20’s and as productivity soared, the benefits of that improved productivity went to the rich, not to workers. The rich lost ground in the Great Depression because the stock market crashed and the banking system imploded. From 1936 until 1979, the share of income taken by the top 0.1% declines rather steadily and significantly. Why? A dominant factor is that income tax rates were rather progressive with high rates on the very high top end. Now this simply means that the share declined – they took a slightly smaller slice of the pie each year. But the pie was growing very, very fast, so in dollar terms their incomes were still rising too. Do not take away the idea that the rich suffered income declines during this period. On contrary, they did well in absolute terms. They just didn’t do well at the expense of others. But in 1979 the rich strike back. Their share of income starts rising steadily until it reaches the same very high levels today that are reminiscent of the late 1920’s. What happened? Well the same forces that hurt the working/middle classes during the last 30+ years worked to the rich’s advantage. But another important shift was changes in income tax policies. Initially Carter, but then Reagan and Bush all cut tax rates for the top end. Reagan did even more. He eliminated several top end brackets. This resulted in people in the top 0.1% (multi-millionaires) now paying the same rates as people making $250,000 per year. That didn’t happen in the Golden Age. Back then there were special brackets for the very, very rich top end. So what can we conclude overall? Well, for one thing, we should definitely bury any idea of “trickle-down” tax cuts helping average workers. When the economy grew the fastest and typical workers did best was when tax rates on the rich were high. When tax rates on the rich are lower, the economy grows more slowly and average worker incomes stagnate. We might also conclude that the OccupyWallStreet movement (#OWS) has a point. The system isn’t fair and it isn’t working for average workers. This isn’t a call for socialism, it’s a call for the vibrant capitalism we had in the mid-20th century. That Golden Age of the middle of the 20th century is the only time when we really didn’t have “class warfare”. We had a social contract that called for sharing the gains from improved productivity. But a little over 30 years ago the really rich declared war on the rest. It’s class warfare and the middle class has been losing.